De Niro's first major film roles were in the sports drama Bang the Drum Slowly (1973) and Scorsese's crime film Mean Streets (1973). He earned Academy Award nominations for the psychological thrillers Taxi Driver (1976) and Cape Fear (1991), both directed by Scorsese. De Niro received additional nominations for Michael Cimino's Vietnam war drama The Deer Hunter (1978), Penny Marshall's drama Awakenings (1990), and David O. Russell's romantic comedy-drama Silver Linings Playbook (2012). His portrayal of gangster Jimmy Conway in Scorsese's crime film Goodfellas (1990), and his role as Rupert Pupkin in the black comedy film The King of Comedy (1982), earned him BAFTA Award nominations. De Niro had a pivotal role in the Francis Ford Coppola film The Godfather Part II (1974), playing the young Vito Corleone. Coppola had remembered his previous auditions for the roles of Sonny Corleone, Michael Corleone, Carlo Rizzi, and Paulie Gatto in The Godfather. His performance earned him his first Academy Award, for Best Supporting Actor, although Coppola accepted the award as De Niro was not present at the ceremony. De Niro became the first actor to win an Academy Award speaking mainly a foreign language. In this case, several Sicilian dialects, although he delivered a few lines in English. He and Marlon Brando, who played the older Vito Corleone in the first film, are the only actors to have won Oscars for portraying the same fictional character. After working with Scorsese in Mean Streets, De Niro went on to have a successful working relationship with him in films such as Taxi Driver (1976), New York, New York (1977), Raging Bull (1980), The King of Comedy (1982), Goodfellas (1990), Cape Fear (1991), and Casino (1995). They also acted together in Guilty by Suspicion (1991) and provided their voices for the animated feature Shark Tale (2004). Taxi Driver was particularly important to De Niro's career. His iconic performance as Travis Bickle catapulted him to stardom and forever linked his name with Bickle's famous "You talkin' to me?" monologue, which De Niro largely improvised. The role of Bickle earned him his first Academy Award Nomination for Best Actor. His portrayal of Jake LaMotta in Raging Bull was lauded, as well as his interpretation of Max Cady in Cape Fear. In July 2018 it was announced that De Niro would appear in Todd Phillips' 2019 film Joker, an original story based on the Batman comic book supervillain The Joker, who will be played by Joaquin Phoenix. De Niro is set to reunite with Martin Scorsese in the Netflix film The Irishman based on the book I Know You Paint Houses by Charles Brandt. Al Pacino, Harvey Keitel, Joe Pesci, Bobby Cannavale, Anna Paquin, and Ray Romano are set to star in the film. The film's teaser trailer was released during the 91st Academy Awards. De Niro has received two awards from seven nominations. A day later, in front of a crowd in Toronto, he apologized to Canadian Prime Minister Justin Trudeau for Trump's "idiotic behavior". He has said that Trump is a racist, and that like many white liberals he was “naive” about Obama's two election wins and their implication of a post-racial America. "I felt we were on a new thing. I didn't realise how against him certain people were – racially against him, offended that he was there." De Niro initially supported the inclusion of the controversial documentary about an alleged vaccination coverup, Vaxxed, at the 2016 Tribeca Film Festival. He explained that his interest in the film resulted from his family experience with an autistic son. De Niro withdrew his recommendation after discussion with the scientific community. He said he was pressured by some festival filmmakers to remove Vaxxed from the festival line-up. He also said that he intends to be a part of the conversation about vaccines and autism in the future. ^ a b "International Rome Film Festival – De Niro: "I have an Italian passport, I have finally come home"". December 30, 2013. Archived from the original on December 30, 2013. ^ a b "De Niro Will Get Italian Citizenship". femalefirst.co.uk. ^ "BAFTA Film Awards: 1990". Bafta.org. February 11, 2014. Retrieved August 15, 2014. ^ Shawn Levy (2014). De Niro: A Life. Crown Archetype. ^ Bosworth, Patricia (February 3, 2014). "The Shadow King". Vanity Fair. ^ a b c d e "Robert De Niro's Religion and Political Views". hollowverse.com. Retrieved February 16, 2016. ^ a b c d e "The religion of Robert De Niro, actor". adherents.com. Retrieved February 16, 2016. ^ Baxter, John (2002). De Niro: A Biography. HarperCollins. ISBN 978-0-00-257196-8. pp. 37–38. ^ a b Dougan, pp. 17–18. ^ a b Dougan, p. 17. ^ "Alumni". HB Studio. Retrieved February 15, 2019. ^ "The inside track on Oscars, Emmys, Grammys and all the award shows". LA Times. September 28, 2010. Retrieved February 11, 2017. ^ "'There was a sense of exhilaration about what we had done'". The Guardian. London. October 16, 2004. ^ "Review/Film; De Niro as Revenge Seeker In Scorsese's 'Cape Fear'". The New York Times. November 13, 1991. Retrieved February 11, 2017. ^ "Cape Fear". Rogerebert.com. Retrieved February 11, 2017. ^ "Robert De Niro's 11 Best and 10 Worst Performances". indiewire. Retrieved February 11, 2017. ^ Brenner, Marie. "Tender is the Plight", Texas Monthly, January 1977. ^ "15th Moscow International Film Festival (1987)". MIFF. Archived from the original on January 16, 2013. Retrieved February 18, 2013. ^ "20th Moscow International Film Festival (1997)". MIFF. Archived from the original on March 22, 2013. Retrieved March 22, 2013. ^ Hayes, Dade (May 17, 2007). "De Niro, Pacino reunite for 'Kill'". Variety. Retrieved August 20, 2008. ^ Graham, Jamie (March 2007). "The Total Film Interview". Total Film (125): 105. ^ Michael Fleming (September 4, 2008). "De Niro exits 'Edge of Darkness'". Variety. Retrieved September 4, 2008. ^ Michael Fleming (September 12, 2008). "Winstone replaces De Niro in 'Edge'". Variety. Retrieved September 12, 2008. ^ Jessica Satherley (October 7, 2010). "Monica Bellucci shows off her hourglass figure as she films with Robert De Niro in Rome". Daily Mail. UK. ^ Vivarelli, Nick (August 31, 2010). "De Laurentiis: Serials killer at box office". Variety. Retrieved January 9, 2011. ^ Satherley, Jessica (October 7, 2010). "Monica Bellucci shows off her hourglass figure as she films with Robert De Niro in Rome". Daily Mail. London. Retrieved January 9, 2011. ^ Abrams, Natalie. "CBS Orders Robert De Niro Crime Pilot". tvguide.com. Retrieved January 21, 2011. ^ "ROBERT DE NIRO, PRESIDENT OF THE JURY OF THE 64th FESTIVAL DE CANNES – Festival de Cannes 2014 (International Film Festival)". Festival-cannes.com. Retrieved August 15, 2014. ^ Miller, Julie (February 5, 2013). "After His First Oscar Nomination in 21 Years, Robert De Niro Opens Up with Rare Interviews, Even Rarer Tears". Vanity Fair. Retrieved March 12, 2016. ^ "Robert De Niro and Frances Conroy join DC's Joker origin film". flickeringmyth. July 24, 2018. Retrieved July 26, 2018. ^ Honan, William H. (August 23, 1989). "De Niro Is Trying Life Behind the Camera". The New York Times. ^ Greenwich Hotel. Greenwich Hotel. Retrieved on August 14, 2010. ^ "Locanda Verde". Zagat.com. May 12, 2009. ^ "The 47th Academy Awards (1975)". Academy of Motion Picture Arts and Sciences. Retrieved January 16, 2014. ^ "The 49th Academy Awards (1977)". Academy of Motion Picture Arts and Sciences. Retrieved January 16, 2014. ^ "The 51st Academy Awards (1979)". Academy of Motion Picture Arts and Sciences. Retrieved January 16, 2014. ^ "The 53rd Academy Awards (1981)". Academy of Motion Picture Arts and Sciences. Retrieved January 16, 2014. ^ "The 63rd Academy Awards (1991)". Academy of Motion Picture Arts and Sciences. Retrieved January 16, 2014. ^ "The 64rd Academy Awards (1992)". Academy of Motion Picture Arts and Sciences. Retrieved January 16, 2014. ^ "The 85th Academy Awards (2012)". Academy of Motion Picture Arts and Sciences. Retrieved August 17, 2017. ^ "The Untouchanles". Rogerebert.com. Retrieved February 11, 2017. ^ "People Magazine". Google. Retrieved August 20, 2007. ^ "New York Real Estate – Prudential Douglas Elliman". Elliman.com. Archived from the original on May 2, 2007. Retrieved January 9, 2011. ^ Staff (December 23, 2011). "Robert De Niro & Wife Welcome Baby Girl". People. Time Inc. Retrieved November 21, 2018. ^ "Toukie Smith and actor Robert De Niro become parents of twins". Jet. October 20, 1995. p. 36. Retrieved December 19, 2010. 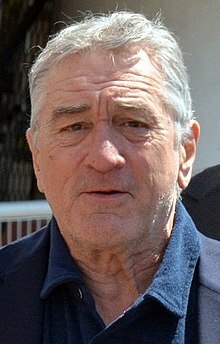 ^ a b "Drug allegations hit De Niro custody battle". The Guardian. London. July 26, 2001. Retrieved August 15, 2014. ^ "Robert De Niro & Wife Welcome Baby Girl". People. December 23, 2011. Retrieved December 23, 2011. ^ "Robert De Niro and wife welcome a child via surrogate". Daily Mail. London. December 24, 2011. Retrieved December 24, 2011. ^ "Robert de Niro four grandchildren". Contactmusic.com. October 18, 2012. Retrieved August 15, 2014. ^ "De Niro's daughter on him as a father and grandfather". Okmagazine.com. April 26, 2008. Retrieved August 15, 2014. ^ "Robert De Niro Splits from Wife Grace Hightower After Over 20 Years of Marriage". People Magazine. November 20, 2008. Retrieved November 21, 2014. ^ "De Niro diagnosed with cancer". the Guardian. October 21, 2003. Retrieved August 7, 2018. ^ a b Horrigan, Jeremiah (October 28, 2014). "Gardiner in battle for Robert De Niro's dinero". Times-Herald Record. Middletown, NY. Retrieved October 29, 2014. ^ "Cinq ans de prison pour le photographe proxénète" [Five years in prison for pimp photographer]. Libération (in French). January 7, 1999. Retrieved May 15, 2013. ^ "De Niro furious over French grilling". BBC News. February 24, 1998. Retrieved August 20, 2007. ^ "De Niro chez le juge" [De Niro in court]. Libération (in French). May 8, 1999. Retrieved May 15, 2013. ^ "Robert De Niro will be President of the Jury of the 64th Festival de Cannes". cannes.com. April 23, 2009. Archived from the original on December 3, 2013. Retrieved August 29, 2013. ^ Chaban, Matt A.V. (November 4, 2014). "De Niro, in Tax Fight, Wins Little Sympathy From His Neighbors". The New York Times. Retrieved November 20, 2014. ^ Chaban, Matt A.V. (November 19, 2014). "De Niro and New York Town End Fight Over Property Taxes". The New York Times. Retrieved November 20, 2014. ^ Horrigan, Jeremiah (November 19, 2014). "De Niro ends tax assessment fight". Times-Herald Record. Retrieved November 20, 2014. ^ "Scepticism and support swirl around Clinton". BBC News. December 17, 1998. Retrieved August 20, 2007. ^ Slattery, Denis (April 3, 2015). "Robert De Niro backing Hillary Clinton if she runs in 2016". New York Daily News. Retrieved June 20, 2015. ^ "De Niro, Damon: Spies, patriotism and politics". MSNBC. Retrieved August 20, 2007. ^ Mireya Navarro (August 29, 2012). "Yoko Ono and Sean Lennon Organize Artists Against Fracking". New York Times. Retrieved May 17, 2016. ^ "Robert De Niro: 'I'd like to punch Donald Trump in the face' – video". The Guardian. Retrieved October 8, 2016. ^ "Robert De Niro uses F-bomb against Trump on live TV". Reuters. June 11, 2018. Retrieved June 11, 2018. ^ Miller, Mike (June 10, 2018). "Robert De Niro Says 'F— Trump' at Tony Awards and Gets a Standing Ovation". People.com. Retrieved June 11, 2018. ^ Mikelionis, Lukas (June 11, 2018). "Robert De Niro throws F-bombs at Trump during Tony Awards". Foxnews.com. Retrieved June 11, 2018. ^ "Trump Blasts De Niro on His Way Home from Singapore: 'Wake Up Punchy!'". Retrieved 2018-06-13. ^ "Robert De Niro reveals he was the one to push for anti-vaccine movie at Tribeca". Los Angeles Times. March 25, 2016. ^ a b c "Robert De Niro steps into autism vaccination row by screening film". The Guardian. March 26, 2016. Retrieved March 26, 2016. ^ Offit, Paul (April 11, 2016). "Anti-Vaccine Doc 'Vaxxed': A Doctor's Film Review". The Hollywood Reporter. Retrieved April 12, 2016. ^ Nguyen, Clinton (March 27, 2016). "Robert De Niro Wants 'A Dialogue' About Anti-Vaxxing at Tribeca Film Festival". Vice. Retrieved 2019-04-12. ^ "Robert De Niro on anti-vaccine film controversy: 'Let's find out the truth'". Today show. April 13, 2016. Retrieved April 14, 2016.